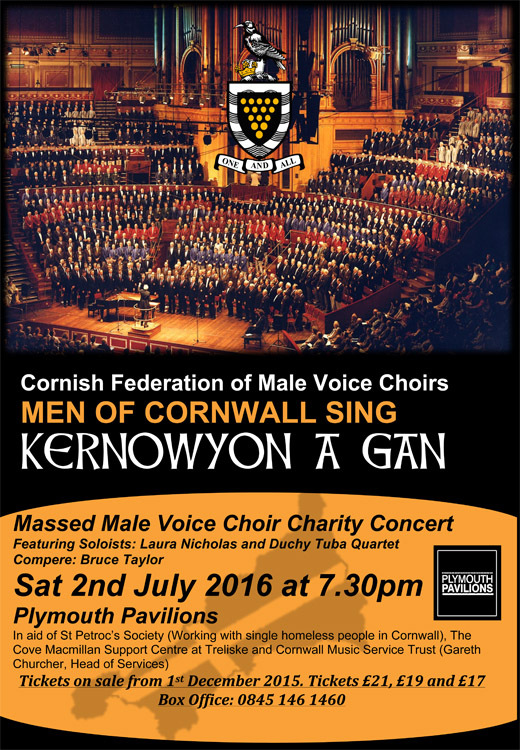 KERNOWYON A GAN - MEN OF CORNWALL SING! Don't miss this wonderful experience! Once again the male voice choirs of Cornwall are joining together to delight their audience with a varied programme of music. Enjoy that rolex ukNicholas, soprano and the Duchy Tuba Quartet. This will be a most enjoyable musical evening that will live long in the memory. Tickets, prices ᬠ頡nd 砭 booking fee may be added - are available from the Box Office: Tel: 0845 146 1460. Rehearsals for the Federation's next Kernowyon a Gan! 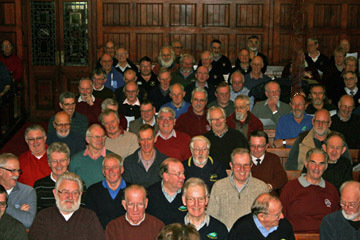 Men of Cornwall Sing charity concert continue with an ever growing sense of enthusiasm. Sunday 10 January was the first rehearsal for 2016 and brought together participants from all over Cornwall. On entering the practice venue in St Austell yesterday I was met with that famous wall of sound which makes you stop in your tracks. It is deeply moving. This will be a wonderful concert with a variety of music, some new, some traditional, all to look forward to. After almost 3 years of planning and 2 years of rehearsals a charity concert in aid of the RNLI, Cornwall Hospice Care and the BBC Radio Cornwall Appeal took place in the Royal Albert Hall, London on 2nd November 2013. A massed male voice choir of 600 voices drawn from 25 member choirs and 2 associate member choirs of the fake watches breathtaking 'wall of sound' by this magnificent massed male voice choir! Soloist performances include the talented Laura Cornish Federation of Male Voice Choirs, supported by Cornwall Cambiata, a 100 strong boys choir, the 70 strong Cornwall Youth Orchestra and an audience of over 4,000 raised the roof of the iconic venue on an evening that will live loud and long in the memories of all who were there. Celebrating their 30th anniversary, this was the fourth time that The Cornish Federation of Male Voice Choirs had organised and presented a massed male voice choir charity concert at the Royal Albert Hall, the last time being in 2000 and in 1994 and 1988 before that. The Federation itself was formed after the pioneering initial concert held in 1983. The Royal Albert Hall Charity Concert rasied 㬴26.71 which was donated equally to the three charities. THE YEAR 2012 saw a series of successful Federation Regional Concerts which took place around the county, from east to west, raising funds for Cornwall Hospice Care and Shelterbox. And this was the year that saw the beginning of negotiations with the Royal Albert Hall to organise a massed choir concert for charity and celebrate the Federation's 30th anniversary in 2013. A 'scratch' massed choir concert was organised to help the people of Bendigo in Australia after the devastating bush fires that destroyed large areas of their homeland. Bendigo has strong Cornish connections with many families of Cornish origin and Cornish street names. Federation choirs often visit overseas and have links with choirs in many countries. TRELAWNY'S MEN SING FOR CORNWALL'S CATHEDRAL! 衴 an experience! To call it a concert is an understatement.奄 This is how one member of a packed Cathedral audience summed up the concert presented by the Cornish Federation of Male Voice Choirs that raised 쳰0 in aid of Truro Cathedralɮspire Cornwall Appeal on the 3rd September 2011. Bishop Tim, Bishop of Truro, made his debut as a male voice choir concert compere on this occasion. His lively and entertaining interjections kept everything moving at a brisk pace. He is going to be in great demand to carry out this function again in the near future! In 2008, the year of the Federation's 25th anniversary, our Truro Cathedral Concert was recorded by the BBC for SONGS OF PRAISE. The soloist was international star, Hayley Westenra. This programme is still currently being shown by the BBC around the world. Four Grand Regional Concerts across the county followed Songs of Praise - and at the end of the year we held a massed choir concert at Truro Cathedral, with international soloist Rachel Garcia Navarro. In 2007 the Federation organised a wonderful event for Children in Need together with BBC Radio Cornwall. This involved choirs and anyone joining in singing Trelawny at the same moment, across Cornwall, from pubs, clubs, restaurants and private homes. Song sheets were sent out to swiss replica watches venues and were available on our website. Everyone who sang put money into the charity. It was broadcast on Radio Cornwall live from Pelynt with a 'Countdown to 9pm' when everyone started singing. It seemed the whole of Cornwall was singing together at that moment. Afterwards people continued to send in money because they had 'sung it at home' or in the car, or wherever they were while listening to the radio! We raised over ᬶ88. CORNISH FEDERATION MASSED CHOIR CONCERT, 23 SEPTEMBER 2006. The first massed concert at the Royal Albert Hall, took place in 1983 - an event which culminated in the formation of the Federation. In 1988 some of Cornwall's renown international figures in the musical world sang at the Federation's concert in the Royal Albert Hall. Guest conductor was Sir David Willcocks and soloists were Ben Luxon and Rachel Hallawell. Goff Richards was composer of the night's finale and the compere for the evening was Richard Baker, well known radio and television personality. Rachel Hallawell and Ben Luxon C.B.E. In 1994 singers from 27 Cornish choirs took part under the musical direction of Edward Goldsmith, one of Cornwall's most respected and experienced conductors, and accompanied by David Briggs, formerly of Truro Cathedral, on the organ and Clive Ellison on the piano. The concert included three prize-winning compositions from the 1994 Composers Competition which were performed by a small ensemble under the direction of Harold Miller. 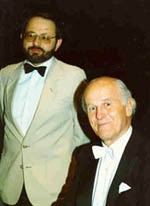 In 2000 the massed choir concert's guest conductor was Dr Roy Wales whose reputation in choral music is internationally known. 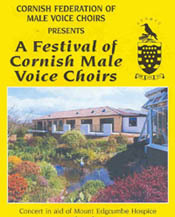 Roger Wills, musical director of the Holman-Climax Male Voice Choir, ably conducted many of the rehearsals in Cornwall. This concert also included guest artistes, the St Keverne Youth Band who were the National Youth Champions of Great Britain having also gained numerous awards for their music. In each of these events the singers from our Cornish choirs gave freely of their time and talents, travelling from all parts of the county free of expenses, to ensure that maximum financial assistance was given to the chosen charities in Cornwall. Funds raised on each occasion were a great achievement, the most recent in the year 2000 raising ର00 for local Cornish charities. A true spirit of 'One and All'. See RECORDINGS for CDs containing live music from the 1994 and 2000 concerts held at the Royal Albert Hall. The International Festival of Male Voice Choirs began in the spring of 2003 and is held every two years. A number of the Federation's member choirs take part in this exciting event. See programmes for individual choirs. 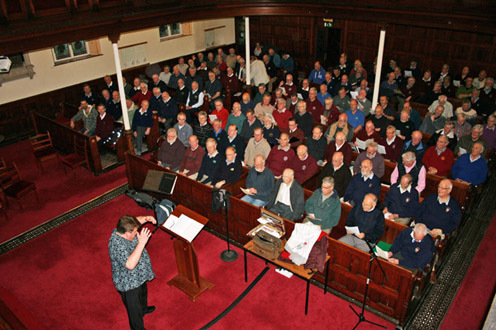 In response to the disaster which occurred in the summer of 2004, many choirs put on individual or small group concerts in their area to raise funds to assist those who had suffered in the floods in North Cornwall, raising thousands of pounds between them. 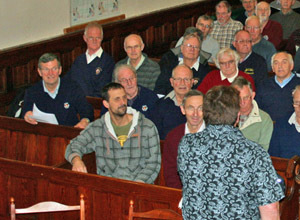 The Federation organised a group concert to raise funds for this cause, held at the Truro Methodist Church in November 2004. The concert was very successful and the audience delighted. 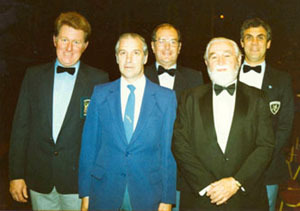 The Concert Chairman was Ray Shaddick, Life Member of the Federation. Nick Hart was the Musical Director and Brian Mitchell and David Robinson, accompanists. Held at the Hall for Cornwall, the Voices for Hospices Concert was a successful venture - a massed choir event with representatives from many Cornish choirs and their individual musical directors and accompanists. The concert was enjoyed by the highly appreciative audience, as well as by the participating members. The funds raised in aid of the Hospice exceeded ⬰00. We have received an update on a previous news item, with revised contact details. Truro Cathedral Old Choristers Association is open to ex-choristers from any Cathedral. 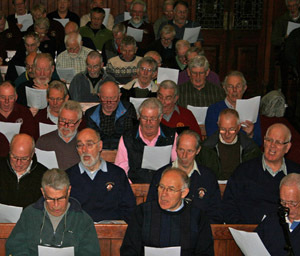 There may be old choristers who are not aware they would be eligible to join the Association and some may be singing in Cornish male voice choirs. Once a year, usually the third Saturday in September, members of the Association sing Evensong in the Cathedral with the present choir, followed by a dinner. If there are any people who used to sing with any Cathedral choir the Association would like to welcome them to join in. Please contact The Association's Chairman, Andrew Pool email: office@andrewpool.co.uk, or write to him, c/o Truro Cathedral Office, 14 St Mary's Street, Truro TR1 2AF. Or if anyone would like a quiet word, just phone Andrew on (01326) 374433. Another memorable occasion took place in 1992, when the BBC invited the Federation to stage a Songs of Praise broadcast for television from Truro Cathedral, with the late Jill Dando as presenter. The venue was filled to capacity and still more wanted to come in. It was such a success that the BBC extended the transmission time. Correspondence received from enthusiastic participants and concert goers continued to flow in for some 9 months after the event.